There is something special about embracing the season and traveling somewhere with sparkling snow and warm drinks. Nothing beats cozying up in front of a warm fire after a long day in the cold air. It’s also a great excuse to indulge in heartier meals and nibble on that extra cookie. Because of this we created a list of our top five coziest winter travel spots to check out with your loved ones, girlfriends, special someone, or even by yourself. It’s time to embrace winter and enjoy the beauty of the season, even if it is downright freezing. Known for its glistening white slopes, Aspen is good for more than winter sports. For example, restore your mind and body with mountain top yoga. Even though the yoga is geared towards skiers and snowboarders, its great whether to wind down and relax, or stretch and build muscle. For kids who are less experienced in skiing and snowboarding, there is of tubing and kid-friendly trails as well. Wind down at the end of the night with a local bonfire featuring food and s’mores. Aspen also has plenty of shopping, great restaurants, and world class pampering. Quebec is another great place for a cozy, winter getaway. The city is known to hold over 500 festivals per year so it only makes sense that Quebec City is home to the world’s biggest outdoor winter festival, Carnaval de Québec. Some of the activities the festival has to offer include fireworks, dog sled races, parades, parties and more. Another appeal to this city is the Hotel de Glace. This hotel is reconstructed out of ice every year. Visitors can take part in daily tours, visit the hotel’s hot tubs and saunas and enjoy a drink in a glass made from ice. Trømso, Norway is one of the places with the highest likelihood of seeing the northern lights. Take a local tour to increase your chances of seeing the lights by monitoring seasonal weather conditions. Go on a hike, go fishing, experience a dog sled or go on a whale safari. To warm up after a long, cold day, visit one of the many pubs or restaurants. The city is known for its nightlife due to being a university town so embrace your inner youth and have a night on the town. Japan is a little more unexpected than the others, but still very much worthy of being on this list. For instance, you can visit the Sapporo Snow Festival which dates back to 1950! The festival shows off huge (some around 20 meters) sculptures made of snow. Another must see during the winter months in Japan is the Shirakawago Winter Light-Up. Homes in Shirakawago have steep roofs and light up on Sunday and Monday nights, making the town the perfect place to snap a winter photo. There are plenty of winter activities to do including snow shoeing, skiing, and ice skating. To wind down after a long day, head over to one of the many hot springs throughout the country. Many of these hot springs are shared with wildlife, so don’t be surprised to see a monkey relaxing a few feet away from you. Last but definitely not least, is Sweden. For one, scientists say this is the best place to see the northern lights so don’t forget to pack your camera. Sweden is also full of winter activities like dog sledding, cross country skiing, snowshoeing and snowboarding. To wind down, Sweden is known for their saunas which most hotels and hostels have available. Enjoy mulled wine and cookies at one of their traditional Christmas markets or sleep in the world's first Ice hotel! 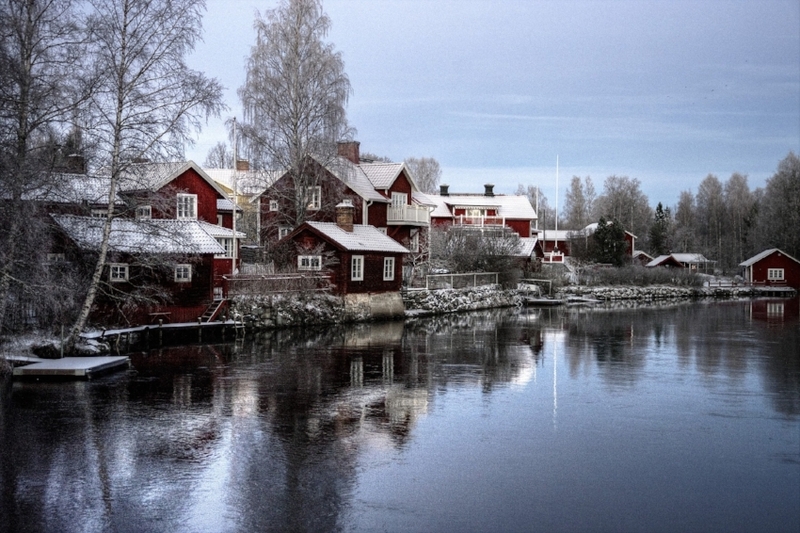 If these reasons aren’t enough to have you packing your bags, flights to Sweden in the winter are quiet cheap, and crowds in the winter months are almost unheard of.